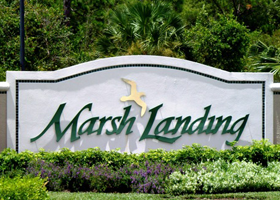 A quiet and secluded gated community, Marsh Landing is conveniently located on the west side of 41 between Coconut Point and Williams Road in Estero. The community presents residents with a secluded setting, yet is close to a number of wonderful area amenities. With three distinct neighborhoods to choose from and a selection of 376 homes, buyers are certain to find a home that meets their individual taste. There is a lively social atmosphere that is family oriented and community center offers a number of programs and activities for all ages. The community has its own television channel and newsletters to keep you posted on all of the exciting activities. Other amenities include a pool and spa, fitness center, bocce, basketball and tennis courts, BBQ and picnic areas.